For those that want a true mountain log cabin (but still be close to town without curvy roads & uphill drives), this is the rental for your group!... VIEW NOW. The Smoky Mountains are the perfect location for newlyweds to celebrate the start of their new life together! To help you make the most of your first getaway as a married couple, Acorn Cabin Rentals has put together five tips for vacationing at our honeymoon cabins in Gatlinburg TN. 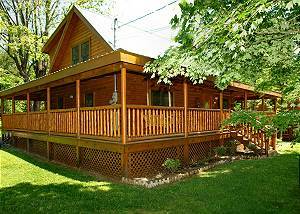 We have a wide choice of honeymoon cabins in Gatlinburg TN. If you browse through the selection, you will notice that some are listed as secluded or semi-secluded. If you want to enjoy one another's company and keep the rest of the world at bay, you should choose one of these private options. Our Romantic Hideaway cabin, for example, provides you with a cozy setting in the woods. At the same time, guests are still only a short drive from the Parkway. This allows you to enjoy your privacy and rejoin civilization whenever you feel like it. Our cabins offer hot tubs or Jacuzzis, which provide you with the ideal way to spend time on your honeymoon. You can create the ultimate romantic setting, with music in the background, candles burning, and perhaps a vase of flowers. After a day of hiking, shopping, or exploring the Gatlinburg area, the Jacuzzi provides you with a way to relax and cuddle together in comfort. When you have your own Jacuzzi or hot tub, you can enjoy this luxury any time of day or night. Nothing is more romantic than watching the sunrise in the majestic Smoky Mountains. You may have to get up a little earlier than usual, but it's worth doing at least once on your vacation. There are several spots in the area that are especially good for catching magnificent sunrises. These include Cades Cove, a famous valley from where you can catch a great view of the sun rising over the mountains. Another spot worth visiting is the Gatlinburg Scenic Overlook, which provides some of the best views of Gatlinburg as well as exquisite sunrises. Watching the sunrise from your vacation rental is also a great option, especially when you choose one of our cabins with mountain views! Our cabins provide you with fully equipped kitchens, so you'll have all the tools and appliances you need to cook the perfect candlelit romantic dinner. You can gather ingredients from local grocery stores or bring some of your favorite delicacies from home. Whether you want to prepare a savory roasted chicken, a spicy Thai curry, or perhaps oysters with butter sauce, you can devote a few hours to preparing a tasty dish or two. Don't forget the wine or champagne and a sumptuous chocolate dessert to end the meal. Honeymoon cabins provide you with all the amenities you need to spend time together in comfort. For some contrast, however, you may also want to seek some outdoor adventures. The Smoky Mountains provide plenty of opportunities to engage in your favorite pastimes or to pick up some new ones. There are hundreds of miles of trails for hiking as well as places to go mountain biking or horseback riding. There are several places in the area where you can go ziplining and see the mountains from high in the air. For an adventure on the Upper or Lower Pigeon River, you can go whitewater rafting or kayaking. There's nothing like working up a sweat and feeling your heart pumping to foster feelings of intimacy! To start planning your romantic vacation in the Smokies, check out our complete listing of honeymoon cabins in Gatlinburg TN!